Came across a bunch of bulrush images and the flamingo and really wanted to use them all... Then I decided to use Tim's faux marbling technique for the background and love the way it turned out. Wow, this is gorgeous! I love to see cat tails at the shore. This is a stunning card! 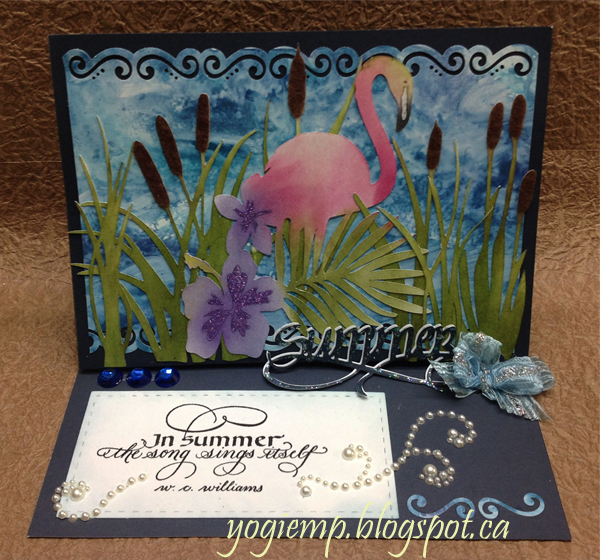 LOVE the marble background with all the fantastic die cuts! Thanks for joining us this week for the QKR Stampede weekly challenge! Hi Yogi; that flamingo is absolutely gorgeous! Love it! The blue bow on the right hand side as part of the stopper is made from ribbon. Such a beautiful take on our theme. A great card and I love the flamingo; so on trend! Thanks for joining us at CCCB! A beautiful scene. Anything nature-themed is so appealing to me, and the colors and images on this are especially so. Would love to see big pink birds on our walks! Its a fabulous creation!! Thanks so much for playing along at CCCB!! What a fun card. Love it! Thanks for sharing with us at Cut It Up.